If you have been watching any local weather news in St Louis, there’s a good chance you know we are about to be hit this week with a polar vortex. This will be the third time in the last decade that the St Louis area will experience extremely frigid temperatures due to a polar vortex system. When this occurs, your home heating system is going to be put to the test like no other time this winter. Just hearing the phrase “Polar Vortex” can make you feel chilly. A polar vortex is described as a low pressure weather system that originates in the arctic at the top of the northern hemisphere. Occasionally, these low pressure systems break off into separate weather patterns and make their way south bringing sub zero temperatures and winds with them. As these large cold fronts move south, they tend to blanket large extremely large area in North America lasing anywhere between 3-10 days. 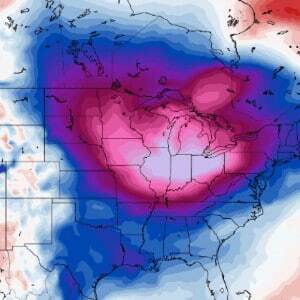 In the past, Polar Vortex patterns have been known to hit as far south as Florida. When we went back and looked at the amount of repair calls that came through during February 2014, it was quite eye opening. During that ten day stretch when the temperature didn’t reach above freezing, we saw a large quantity of service repair calls come through. Even more alarming were the amount of home heating systems that were not functioning at all. Failure among older furnaces were a very common trend. Which makes sense. Older home heating systems are often the most vulnerable to malfunction when temperatures are consistently cold. As the local forecast predicts extremely below average temperatures this week, it’s important to make sure your home heating system is ready to face the challenge. Below are just a couple of easy ways you can help prevent home heating system failure ahead of a polar vortex. Make Sure To Replace Your Furnace Filter– Clogged or dirty furnace filters can make home heating systems work much harder than they need to. When a furnace is constantly running over a long period of time in order to maintain comfortable indoor temperatures, the last obstacle it needs is to be overcompensating for a lack of air flow. Changing out your filter, even if it is a little earlier than normal, can not only prevent furnace failure, but also help increase efficiency when your system is set to labor more than usual. Not to mention, having a clean furnace filter will also help increase your indoor air quality during a period of time you’ll likely be spending indoors. Replace The Batteries On Your Thermostat– If you haven’t replaced the batteries on your thermostat in awhile, now is a great time to do so. For some reason, this problem tends to occur at the least opportune time. It’s always better to be safe than sorry. Have Your System Maintenanced By A Professional Ahead of Time– It’s never too late in season for seasonal maintenance. If you have been noticing your home heating system not running as well as it has in the past, there could be a larger problem looming. One that will likely be exposed when it is continually running over a 3-5 day period. Furnace check-ups usually come at a reasonable cost and only take 30-60 minutes to complete. The cost is often worth the piece of mind. If you suspect that you are experiencing problems or under-performance with your home heating system, please don’t hesitate to give us a call. We can have a certified service technician at your home as quickly as possible to fix any issues behind your furnace not heating properly. To set up your home heating system repair today, call our office at (314) 209-7500 or fill out the online form below.